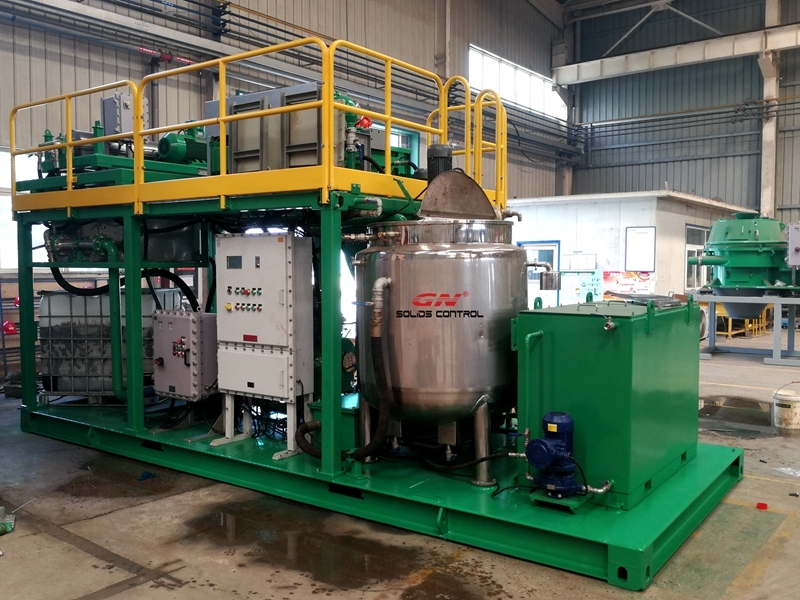 One unit of 5m3/h oil sludge separation system is ready for shipment recently, the model is GNOST-05A. we also have GNOST-01A with 1 m3/h treating capacity, GNOST-15A with 15m3/h treating capacity for option. As the most professional solids liquid separation equipments manufacturer in China, GN solids control can design and produce drilling mud solids control system, drilling cuttings treatment system, oil sludge treatment system, shaker screens. The oil sludge separation system can be used for refinery crude oil tank bottom cleaning sludge treatment, oilfield waste oil sludge treatment, oil contaminated earth and all other types of oil sludge. 1) Sludge vacuum pump: this is a 100% air operation pump, no need electricity power supply. It has option for automatic and manual operation, the transfer rate could be 10m3/h, 20 m3/h and 40 m3/h. The max suction distance is up to 500m, and the max discharge distance is up to 1000m. 2) The shale shaker with internal spray system and cover to prevent the oil sludge from splashing to separate the coarse solids from the oil sludge, the shaker screen opening is 1mm or 2mm, the purpose is to protect the centrifuge screw. 3) The VFD decanter centrifuge to separate the fine solids from the oil sludge by working with chemical dosing system. The reason to use chemical jetting is to help the centrifuge to separate the oil from the solids more clean. 4) The 3 phase centrifuge to separate the oil from water, the oil is recovered by the refinery and the water is put into the circulation system. 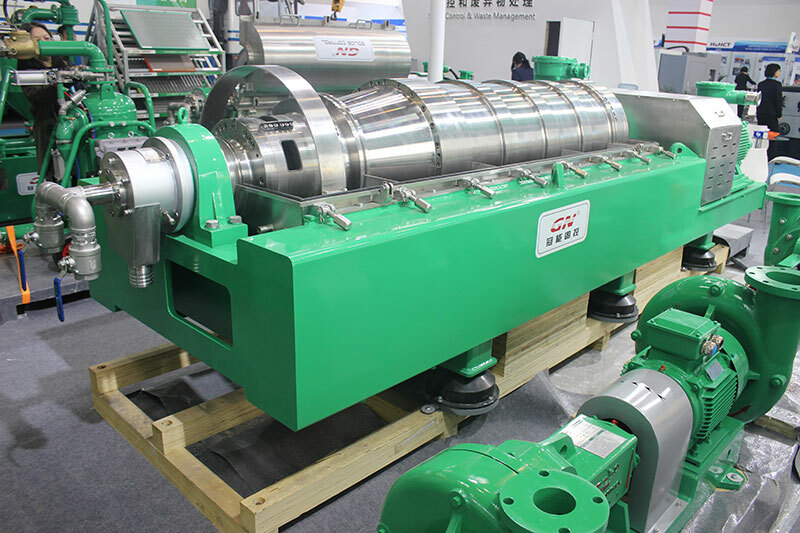 The decanter centrifuge should separate the fine solids as much as possible, otherwise it will block the 3 phase centrifuge. 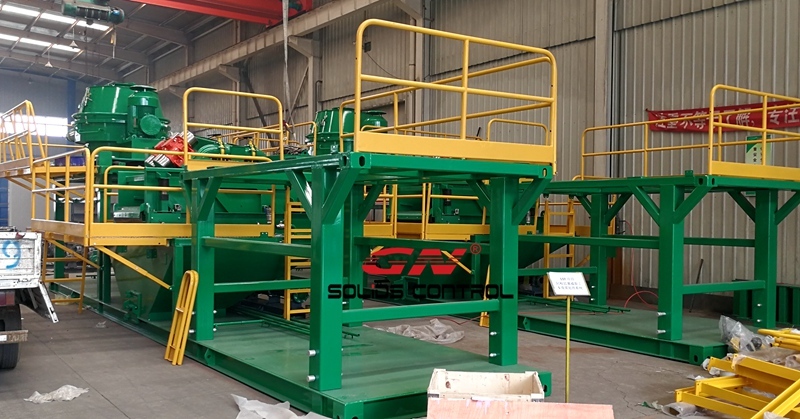 If you need more information of oil sludge separation system, pls contact with GN solids control. This week GN solids control participate in CIPPE 2019 successfully. We got positive feedback from our client for the oil sludge treatment system and pitless solution for oil & gas drilling. The pitless solution also called zero discharge system for drilling rig, it includes water based mud and oil based mud, the design is very different. For water based mud pitless system, the main equipments are screw conveyor, high G drying shaker, VFD decanter centrifuge, dewatering unit and solidification unit. The oil based mud drilling waste management system , the major equipments are screw conveyor or vacuum pump, vertical cuttings dryer, VFD decanter centrifuge, we have standard design drilling waste management system for option, with treating capacity 40 m3/h. As per the new environmental protection laws, it is forbidden to dig a hole for storage of the waste drilling fluids and oil waste at the drilling rig site. It is a pollution of ground water and earth, and hard to treat the waste after drilling is finished, you need to waste more money and more time. 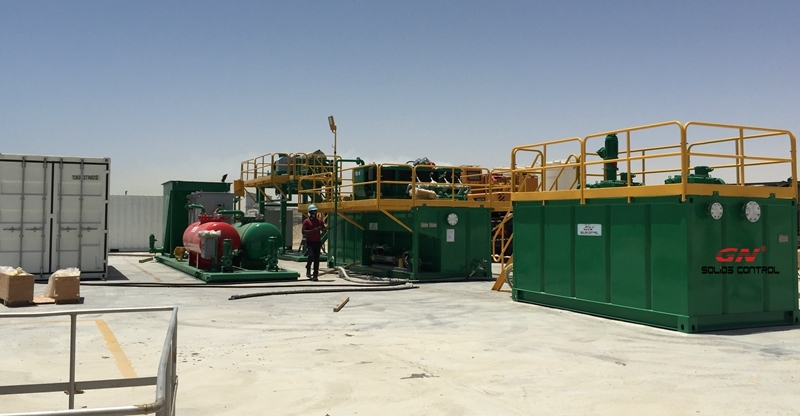 The better way is to treat the drilling waste timely by using pitless system. The useful drilling fluids can be recycled to prepare for new drilling fluids, the discharged solids can be used for landfill or construction industry when it meets the disposal standard of the specific country. 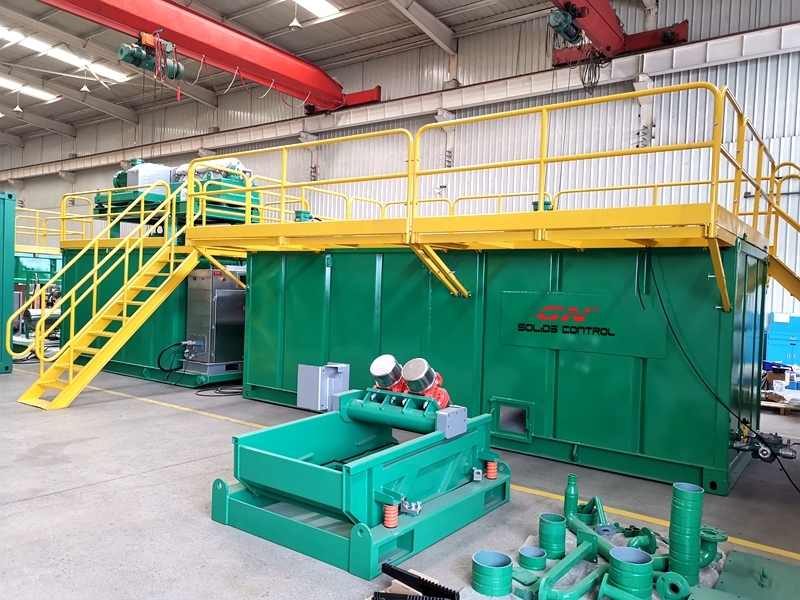 We also showed our compact design oil sludge treatment with the treating capacity 0.5 ~1 m3/h, the main configuration including shale shaker, decanter centrifuge, three phase centrifuge, pre-mixing tank, fluids collection tank and chemical dosing system, oil tank and water tank, all the equipments are installed on one skid for convenient transportation and operation. We have bigger size oil sludge treatment system with 5 m3/h and 15 m3/h for option, welcome to send us your inquiry. This week one unit of containerized 15 m3/h oil sludge separation system to Europe client. 1) Pre- mixing tank: the pre mixing tank is necessary, it will influence the result of the equipments next, like shale shaker tank, decanter centrifuge tank, disc centrifuge tank. 2) Shaker tank: the shale shaker with mud agitator installed on top of the mud tank, heating lines around the tank to increase the oil sludge flowability and increase the decanter centrifuge separation performance. 3) 2 phase separation tank : the 22 inch decanter centrifuge installed on top of the tank, the screw pump installed on the same skid, and the screw conveyor collect the solids from the solids discharge port of the decanter centrifuge and transfer outside the container. 4) 3 phase separation skid ：the disc centrifuge installed on the skid, the fluids discharged from the centrifuge fluids port flow to disc centrifuge, the clean oil and water will be pumped to separate oil tank and water tank. 5) Chemical dosing system: the chemical dosing system with 3 mixing tank chemical dosing system, and the coagulation system, each tank with chemical dosing pumps. The oil sludge separation system is used in cold area, so all of the equipments are installed inside the 40ft container to keep it warm. We also consider the operation convenience for the user. This is the repeat order from the same client, they bought one unit of 1 m3/h oil sludge separation system several month ago, and satisfied with the result. Except for oil sludge separation system, GN solids control also provide good quality solids control system, drilling waste management system, we will send the question list to the client to know the project information firstly, then we will design customized system for our clients. 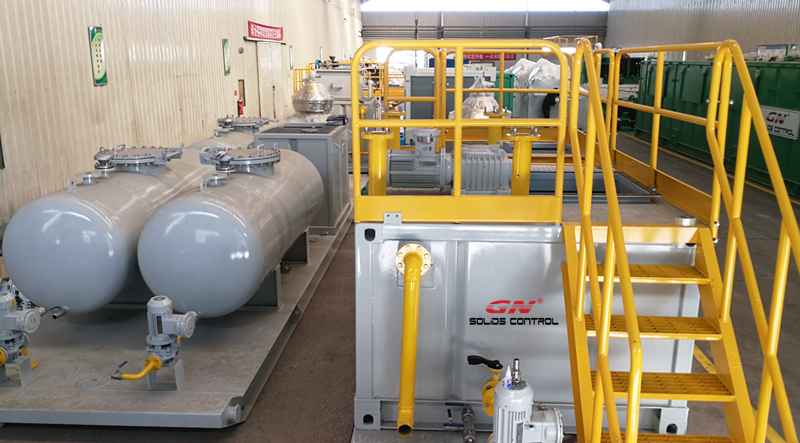 2 sets of oil sludge separation system are finished production in GN solds control, one system with grey silver color is 2 m3/h oil sludge treatment system , the other one is 15 m3/h oil sludge treatment system, which will be released next week. 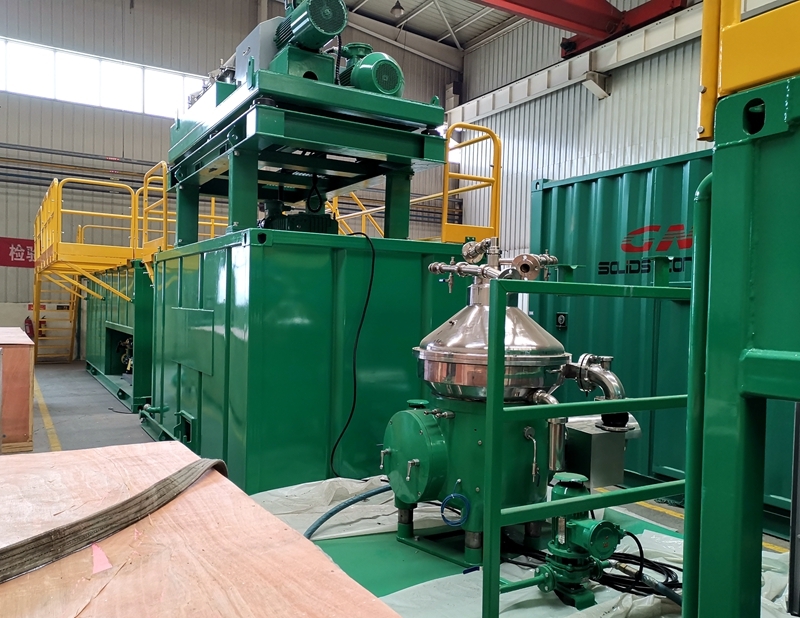 The 2 m3/h oil sludge treatment system is a trial order for the client, if it works well, the client will repeat order for a bigger one, GN standard and customized oil sludge separation system has been proved the performance. Premixing tank is the necessary part of the oil sludge separation system, the sludge vacuum pump transfer the oil sludge from the waste pit to pre mixing tank for heating, agitating, chemical jetting, without proper premixing, the fluids flowrability will be increased, the separation result will be better. 2) Classification modular, the oil sludge from pre mixing tank will be transferred to V tank bottom which with screw conveyor on the bottom, after classification, the top layer will flow to disc centrifuge, the bottom layer will be washed, chemical jetting and transferred to solids control manular. 3) Solids control modular: it consists of shale shaker and 2 phase decanter centrifuge for liquid solids separation. The clean fluids separated from 2 phase decanter centrifuge will also flow to disc centrifuge modular. Both of the tanks with heating line around for heating the oil sludge and increase the separation efficiency. 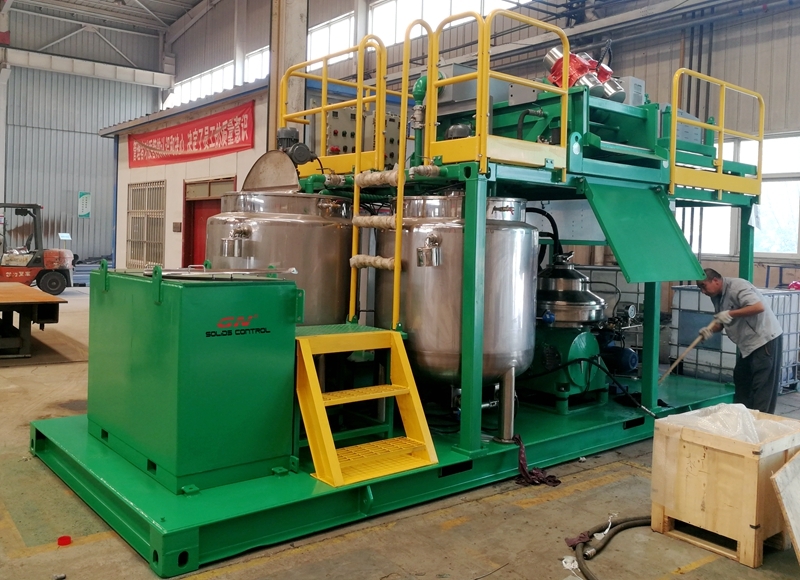 4) 3 phase separation skid: this is a back up skid, including gravity type oil water separator, once the disc centrifuge failed to work or during maintenance, the 3 phase separation skid will be work as back up. GN solids control can design and produce customized oil sludge separation system as per client’s different requirement. Pls contact with GN team freely. 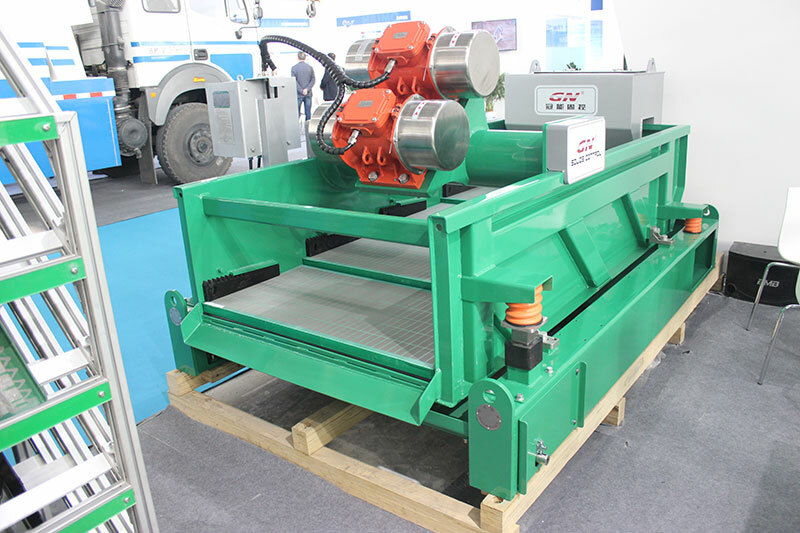 This week we shipped one set of oil sludge separation system to Europe client, this unit has been demonstrated in CIPPE 2018 oil exhibition in Beijing, and got interests from many clients who is in oil sludge separation projects. 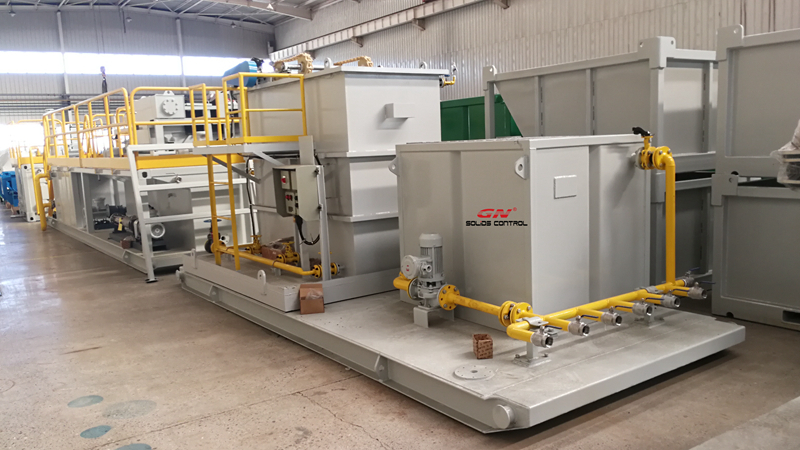 After the exhibition, the oil sludge separation system was shipped to a client’s jobsite for oil sludge separation testing, they are satisfied with the result. 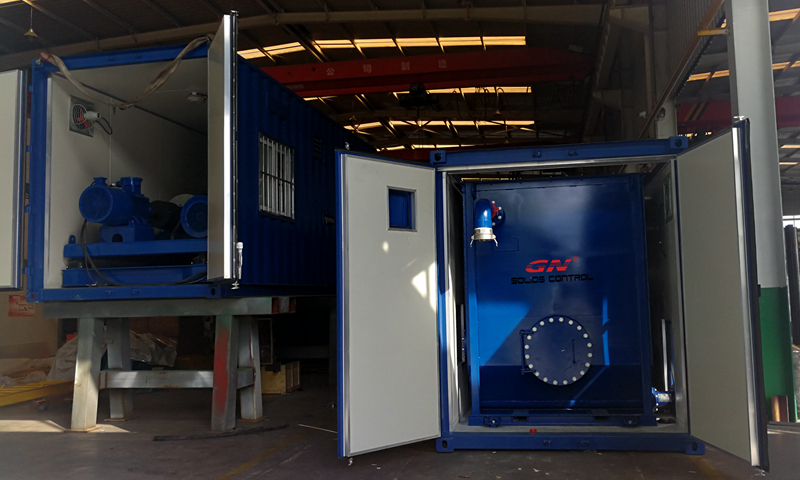 After testing, the unit is shipped back to GN facility for cleaning and maintenance, and purchased by Europe client. They also ordered a 15 m3/h oil sludge treatment unit which is under construction. 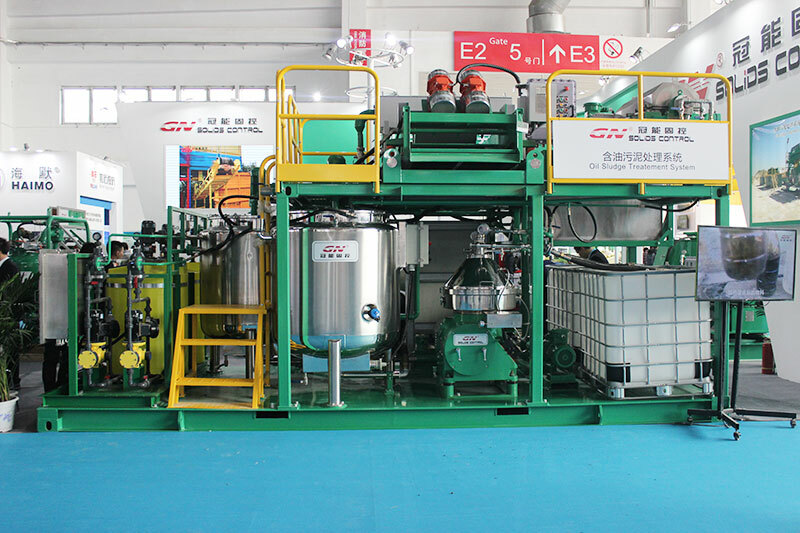 As a professional oil sludge separation system manufacturer in China, we have provided many sets of oil sludge separation system to our international clients, to use it for refinery oil tank bottom cleaning oil sludge treatment, hazardous oil contaminated waste treatment, drilling cuttings waste treatment, etc. projects. 3) Complete function of solids liquid separation, oil water separation, chemical dosing system, heating and pre-mixing system and pure water collection, pure oil storage. 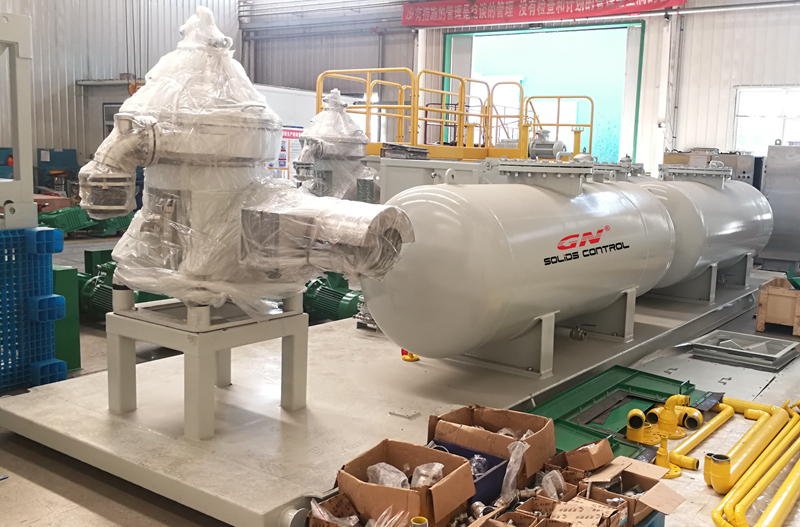 This week GN solids control shipped 8 units of vacuum pump to our client in Beijing for long distance mud transfer project. These 8 units of vacuum pump are packed by 2 sets of 20ft container, each container with 4 units of vacuum pump, this is for convenient transportation, sun proof, rain proof, all the pipelines will be connected and equipped with air buffer vessel, the air compressor must be needed for vacuum pump operation, because this vacuum pump is 100% drived by air. 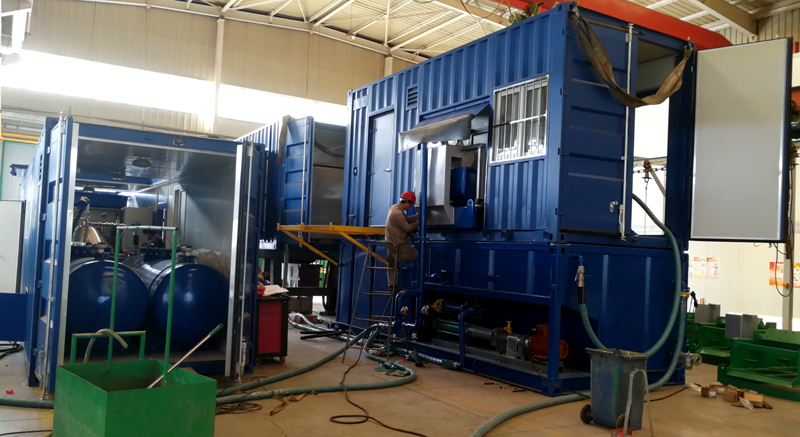 The vacuum pump is fixed and installed in the container, the container is special made with windows, doors, it can be transported by the container size trailer easily for convenient moving from one rig to another. 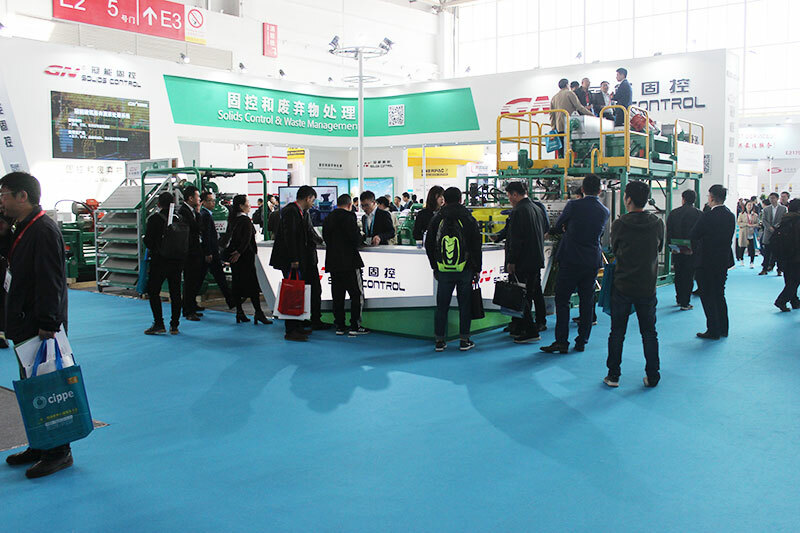 The client has the problem to transfer the mud from the mud pit to the rig for such a long distance for a long while, when they saw our vacuum pump at CIPPE, the biggest oil exhibition in Beijing, they showed interests and after several month negotiation, they accept the proposal provided by GN and place the order. The vacuum pump also called sludge vacuum pump, solids vacuum pump, it can be widely used to transfer the drilling mud, drilling cuttings, waste, hazardous waste, oil contaminated soils, waste oil, if you need a customized solution for waste mud transfer including dredging slurry, pls contact with GN solids sales. We will choose the proper model vacuum pump for our clients as per their site situation, sometimes the client need to take the oil sludge from the 20m high oil tank in the refinery, but the man hole is too small to put a vacuum pump in, we will do a disassembly for the client, and assembly them inside the tank, we will disassembly parts as less as possible so that the client can install them easily. 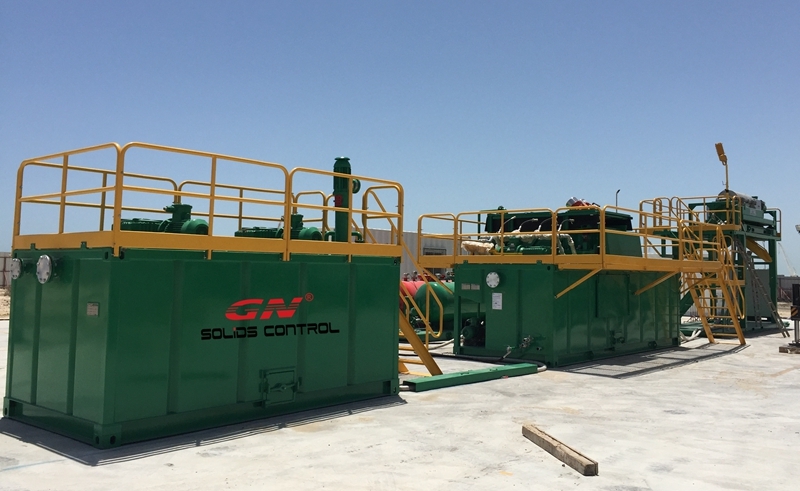 Several month ago, GN solids control shipped 2 sets of oil sludge separation system to Middle east client, now the oil sludge separation system has been installed successfully in the client’s site. The function of pre-mixing unit is increase the flowability and lower the viscosity of the oil sludge through the agitating and heating line, the boiler can provide the hot steam to the heating lines to heat the oil sludge. The oil sludge is storaged in the waste pit and it is transferred by vacuum pump to the pre-mixing tank. But the client needs a air compressor for the working of vacuum pump. The shale shaker is special designed with cover to avoid the oily sludge splashing and there is hot water spray line to spray hot water to the shaker screen, to prevent the shaker screens from blocking, which will make the shale shaker working better. We provide different model decanter centrifuge with different treating capacity with oily sludge, right not we have 10m3/h decanter centrifuge and 20~25 m3/h decanter centrifuge. The VFD control panel is installed on the telescopic skid with the screw pump. The static mixer is used to mix the chemical before feeding to the centrifuge feed pipe. The chemical dosing unit is installed in the 20ft container for convenient operation and shipment. The 3 phase separation unit including slant plate clarifier, gravity type oil water separator and micro bubble type oil water separator. The clear water and clear oil is flow to the water buffer tank and oil buffer tank. The water pump and oil pump will transfer the water and oil to the storage tank automatically once it is reach the setting value. 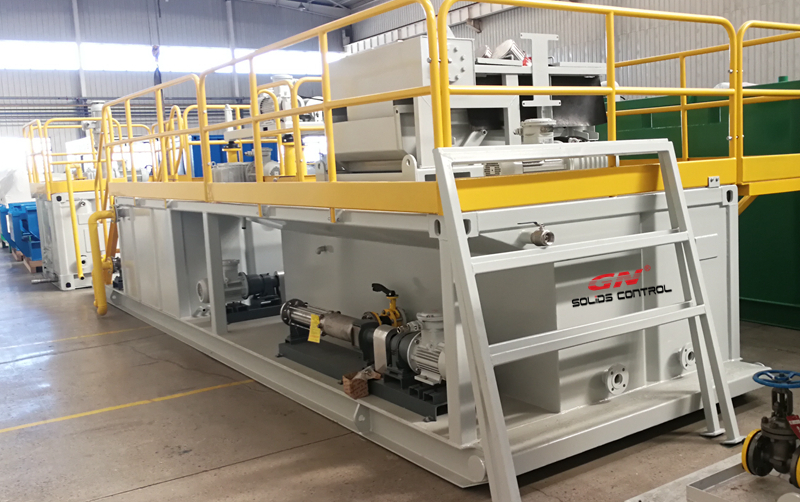 Recently GN Solids Control shipped 2 sets of oil based drilling waste treatment system to South America, the client has compared many different proposals from USA and China, finally choose GN by considering the company strength, the drilling waste management system experience, the technology, quality, and after sales service. As the top manufacturer of solids control equipments and drilling waste management system, GN solids control keep growing very fast since 2008.We got positive feedback from our international clients and keep improving our equipments design and performance, until now we already own the advanced technology of oily sludge separation system, Thermal Desorption Unit, vacuum pump, cuttings solidification unit, big bowl big volume decanter centrifuge, F version shale shaker, D version decanter centrifuge, composite material frame shaker screens, etc. 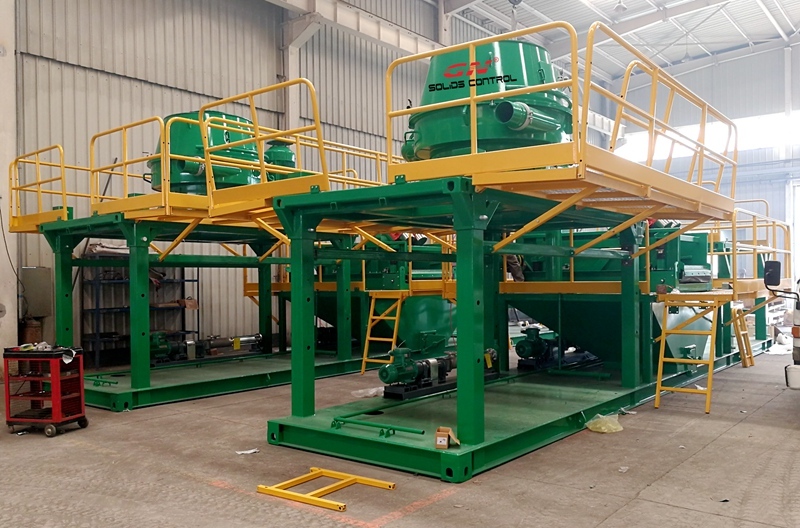 The 2 sets of oil based drilling waste treatment system shipped to South America is our standard design of drilling waste management system, just a little bit change for customized requirement. The drying shaker is installed on the V type mud tank between the cuttings dryer and decanter centrifuge, when the solids content in the waste cuttings is very big, the fine solids remained in the discharged fluids from vertical cuttings dryer is still very high content, which will be easily block the centrifuge bowl, and damage the centrifuge. The shale shaker with fine mesh screens is used to reduce the solids content and promise the centrifuge a better separation performance. 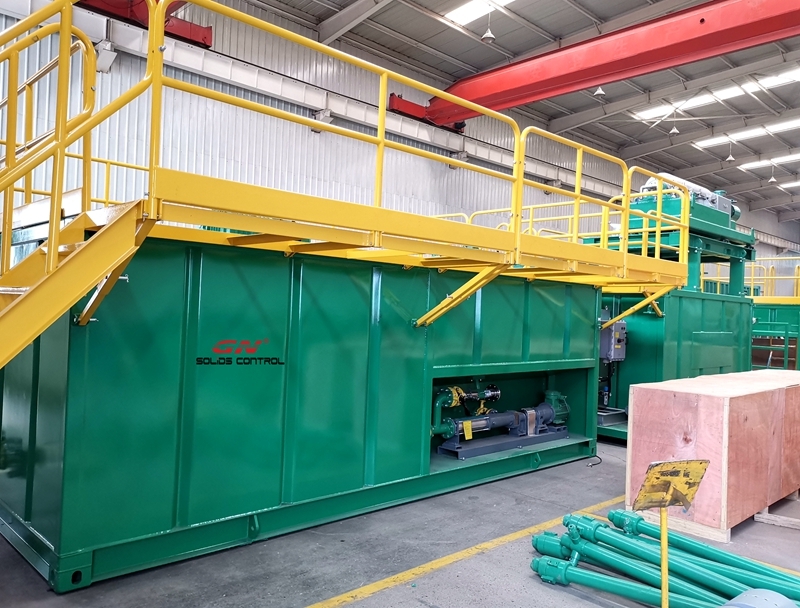 The electric cradle is used to replace the screen basket of the vertical cuttings dryer, mostly there is no big crane in the jobsite, such design will be convenient to replace the wear parts itself, do not need to pay extra money to lease a crane. After treated by our drilling waste management system, the oil in the cuttings is lower than 5%. 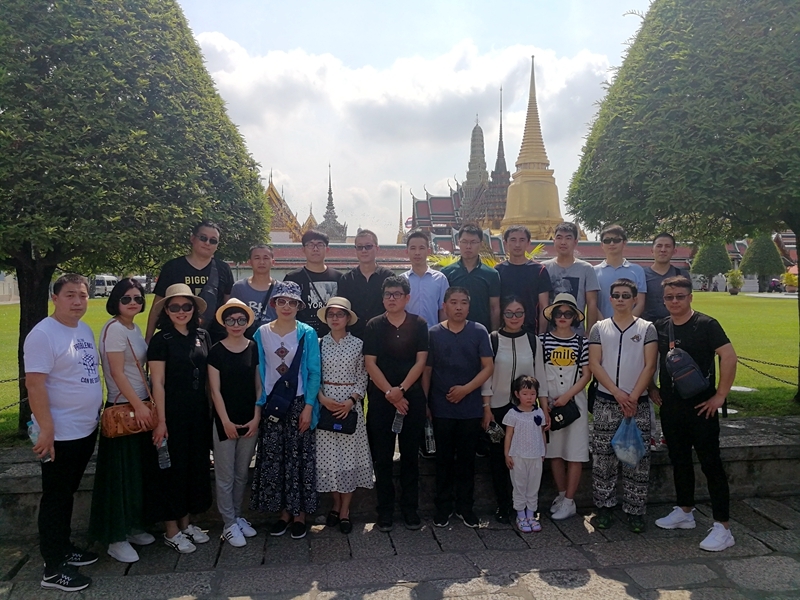 This week GN solids control sales team had a great time in Thailand, this is not the first time for GN international sales team and domestic market sales team go out together for sightseeing and teamwork development. GN sales team is an independent , hard working, professional team among all the sales team in the competitors in the oilfield solids control equipments industry, all our sales is as a sales engineer, who can answer the questions of our clients professionally and solve the problems for the clients before or after sales. 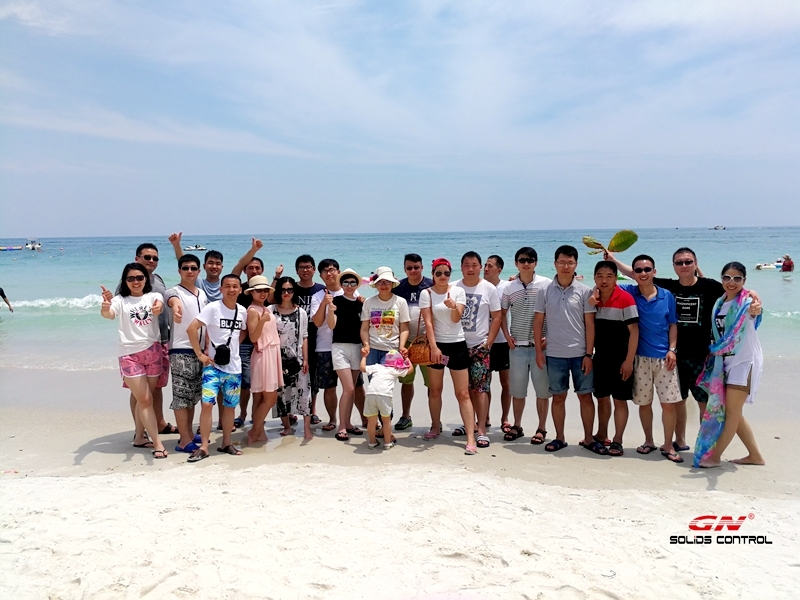 Our 23 persons team enjoy our holiday in Thailand from March 25th to March 30th, all of us are hard working during the working hours, we also enjoy our living out of the working day. Last week our sales team participate in the CIPPE oil show in Beijing, China, and showed our lastest design products to the clients from domestic and global market. GN solids control keep developing new products and introduce new technology to seek for the top one company in the separation equipments area, our shale shaker, decanter centrifuge, mud cleaner can be used in any applications for solids and liquids separation, also we develop oil water separator for oil recovery.